For a list of members running for office, please review the 2018 board of directors candidate biographies. Vote at the annual meeting – Print and fill out the WCC 2018 election ballot, and turn it in at the annual meeting on December 16. Vote absentee – Print and fill out the WCC 2018 election ballot, and mail it to PO Box 384287, Waikoloa, HI 96738. 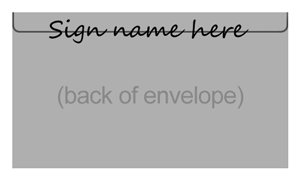 If you choose this option, please sign your name across the seal on the back of the envelope (see picture). Vote online – Email Marcie Davis (marciedd@yahoo.com) to request an electronic ballot. The email must set forth the voting member’s name and current email address, and that email address can only be used once for voting (i.e., two qualified members cannot vote from same email address). Your name will be checked against the membership list and you will receive a link for voting. Once you request an electronic ballot, you will be considered to have voted electronically and excluded from other options. Electronic ballots must be requested on or before December 10, and electronic voting closes on December 13 at 12 midnight HST. For more details regarding club voting policy, please refer to Article V of the Waikoloa Canoe Club Bylaws. Feel free to email Rami Ring (secretary@waikoloacanoeclub.com) or Marcie Davis (marciedd@yahoo.com) of the Nominations Committee with any questions you may have.